No sé ustedes, pero nunca me he sentido estar viviendo en una colonia cubana tanto como me siento esta semana. No sólo ahora nuestras órdenes vienen directamente de Cuba, donde Chávez prefiere recibir un tratamiento que podría perfectamente recibir en casa, y que, probablemente, seria de mejor calidad, pero sus últimas decisiones nos dejan con el tufillo rancio del colonialismo. I do not know about you but never have I felt as much a Cuban colony as I am feeling this week, and it is only Tuesday. Not only now our orders come directly from Cuba where Chavez prefers receive treatment that he could perfectly receive at home, and probably of a much better quality, but his latest decisions reek of old style colonialism. And thus we return to the past. This week end Zulia state reached very high temperatures and suffered a major blackout, long enough (a day in some areas) that even your ice cubes in the fridge melted. I supposed in a way it was the last straw for a government that decided to punish the customer for the blackouts: we consume too much electricity, it is not the government's fault, never was, and of course, never will be. Before Chavez, blackouts were occasional, under Chavez they are regular but that part of the much hated 4th republic is never brought forward by the regime. Thus today new harsh sanctions have been approved for those who are not able to bring their electricity usage 10% below their 2009 level. Observe also on the picture that Chavez is bigbrotherly present at the announcement even though he is, supposedly, recovering in Cuba. One wonders if Jaua and Rodriguez subconscious did not betray them, trying to link the new sanctions to Chavez and not to their incompetence in solving the electricity crisis for which they have been in charge for a bout a year now. Idiots in the net, putting all of us at risk: MacMaster and his fake "Gay girl in Damascus"
This week grievous damage was done against all of those who have put their life at risk by blogging against any form of oppression. I am not talking of people like Yoani Sanchez who is now a star in her own right, or even to modest activists like yours truly who signs with a "non de plume" but who has revealed his true identity and face to many of the people that interviewed him over the years (there are many reasons to use a pen name and not necessarily to hide, simply to separate public from private life). Gustavo Coronel hoy, de una manera descarnada, les va a explicar lo ridículo y cursi en el que esta cayendo el régimen autista al cual ustedes por alguna que otra razón todavía apoyan. Ahora bien, no se vayan a creer que Gustavo trata de ridiculizar solo a su micomendantepresidente. ¡No, no! Los dos comunicados que el analiza no fueron escritos por Hugo I, aunque si firmados por el. Lo extraordinario es que la corte de su micomandantepresidente haya llegado a un nivel de idolatría para parir ese tipo de literatura y que el susodicho lo encuentre hoy en día normal y necesario, y digno de su firma. Aquí los ridículos son los que participan en ese sistema y, por ende, los que lo apoyan. One has to wonder in what type of world does Chavez live in. But we can certainly surmise that he is not in a very nice one, no matter how much he might enjoy his power for mischief. If you ask me, the article that has more significance for the future of the West is the musings of "Charlemagne" at the Economist. Do yourself a favor and read it. And then wonder for a few minutes what the fate of the Western world is in front of Islam fundamentalist terrorist or narco states like Venezuela. Ustedes siguen con esa conseja de que lo único que alienta las revueltas de la primavera árabe son las conspiraciones yankis para agarrarse el petroleo. Y sin embargo día treas día deberian de darse cuenta que esa visión se estrella con la realidad, y que la única razon por la cual el cínico mayor, el micomandantepresidente apoya a asesinos como Gadafi y Asad es porque le tiene culillo que algún día se la apliquen a el por transformar a Venezuela en un narco estado. That "alien" cartoon of Weil today says it all. Even the editorial of Petkoff limits itself at wondering whether Ollanta Humala will chose the Lula line of send Peru into chaos, Chavez style. Which is an elegant admission by Petkoff about his serious doubts about Ollanta Humala, doubts that were certainly discarded way too fast by Vargas Llosa. For Peruvian friends new to this blog and Weil, the cartoonist represents Chavez as a military boot talking. The immigration of Venezuelan to Miami is a known phenomenon. Mostly, it is for retiring, for menial service jobs or those who already do business with the US and prefer to do it from Miami than from Caracas even if it requires flying to Caracas on a regular basis. But this article in Semana from Colombia details how the hard working, productive class of Venezuela is starting to migrate en masse to Colombia, to Venezuela's great loss of course. Not only Peru was voting today, but also Portugal and in a way, for each continent, each election was as crucial. What is one to think about the recent trip of Brazil's ex president Lula da Silva to Venezuela and Cuba? [UPDATED] The Peruvian second round tomorrow has drawn so much ink (and even some blood) that one would expect a distant observer to pull his hairs in agony at how come a country has reached such lows. But if indeed the lows have been reached, surprisingly at the end the choice of lesser evil has turned out to be simpler than expected. I am not inclined to blog lately because the uselessness of it all on occasion is too much to bear. 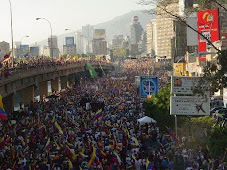 Not that I think that my blogging would do much good, but I am reaching a point of getting too embarrassed about "la veulerie" (spinelessness?- 1) of the Venezuelan electorate to write more about it. The fact of the matter is that in spite of 12 years of mismanagement Chavez has been able to bounce back to parity and up with the opposition in the polls by the mere launching of a "mision vivienda" which cannot be executed properly (a brief calculation of the promise yields that result that the country needs to build, DAILY, 900 housing units for the next 6 years when I know personally that I get into all sorts of trouble to get a couple of cement bags to fix the driveway at work). Fortunately for us this week Weil at Tal Cual has drawn a BRILLIANT series of cartoons illustrating fabulously well how the largest chunk of the Venezuelan electorate works. This one in the same vein let's you know that the housing mirage of Chavez is going to work at getting votes even if the result of "mision vivienda" is more than predictable, and disappointment is certain. But after 2012 when Chavez will be so entrenched in his castle that we are looking at a Libya/Iran/Yemen scenario. This one is a simple take on the mirage of that latest mision: we all know it is impossible, and even those who ask here know that, as they sense that few will get a cheap to free home. But they do not care, it is like the lottery, they think all that they will be the lucky winner as long as the regime remains in place. But why have we become such a "gimme!" culture? The next cartoon give us the answer: 12 years of "red" discourse, symbolized by that red mosquito. Observe the nice allusion to the famous say "teach a man to fish...."
For Weil there is no doubt that chavismo has been a cancer on our spirits and he is blunt about it. "Pancreas Cancer"; "Lung Cancer"; "Conscience Cancer" (with the allusion to chavista "Uh!Ah!, Chavez no se va" as something that will remain in our country psyche long after Chavez is gone). "Justice! Values! Work!" against the Chavez promises of everything and the sink. And you want me to keep posting? What for? 1) I cannot find a good word for the French "veule" which means at the same time weakness of spirit but also the willingness to be weak, spineless, almost amoral.